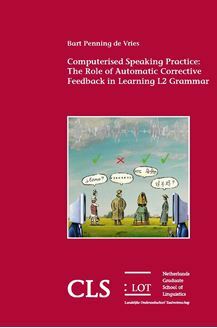 The role of corrective feedback (CF) in improving second language (L2) oral proficiency has been an important discussion in the field of second language acquisition (SLA) for many years. So far, conclusive evidence on CF is lacking, as experimental conditions have been difficult to control in CF studies on oral proficiency. To address the need for controlled research, we developed a computer assisted language learning (CALL) system that makes use of Automatic Speech Recognition (ASR) to provide CF on oral production. This dissertation shows that CALL systems with ASR are an important innovation for SLA research. It allows for practicing oral skills with CF under controlled experimental conditions, with detailed logging of learner behaviour. In our experiments, adult learners of various first language backgrounds practiced successfully with this system. We found that providing CF on speaking practice is more effective than spoken practice without CF, but that this is in interaction with specific learner variables. The learners’ L2 proficiency is an important factor in determining the effectiveness of speaking practice with, and without CF. In addition, the learners’ education background influences the effectiveness of CF. Most CF studies are performed with high educated learners, but we show that these results do not generalize to all L2 learners. We also show the added value of logging learner behaviour during practice with a CALL system. This data can be inspected to determine when effective L2 practice is taking place. In turn, this can inform SLA research and (adaptive) CALL design.